If your interview fits seamlessly as the warm-up act for a presidential pep rally, what you’re doing isn’t journalism, it’s propaganda. No one would confuse Pete Hegseth, the Fox & Friends weekend co-host who interviewed President Donald Trump before Thursday night’s rally, in Billings, MT, for a journalist: He’s a dedicated Trump supporter with aspirations to join his cabinet. But in a very competitive field of bizarre Fox interviews during the Trump presidency, Hegseth’s may take the gold for propagandistic absurdity, with the Fox host agreeing to ask the president his questions on the arena’s stage in front of the raucous crowd of Trump supporters. The interview aired Friday on the network’s morning show. At any other news network, questions would be raised about the journalistic ethics of a host participating in a presidential event whose purpose was the support of Republican candidates. But Fox’s ongoing willingness to send obvious sycophants like Hegseth to interview the president by itself makes a mockery of the network’s pretense of journalistic credibility. And yesterday’s farce shows there is no limit to Fox’s willingness to collaborate with the Trump White House. 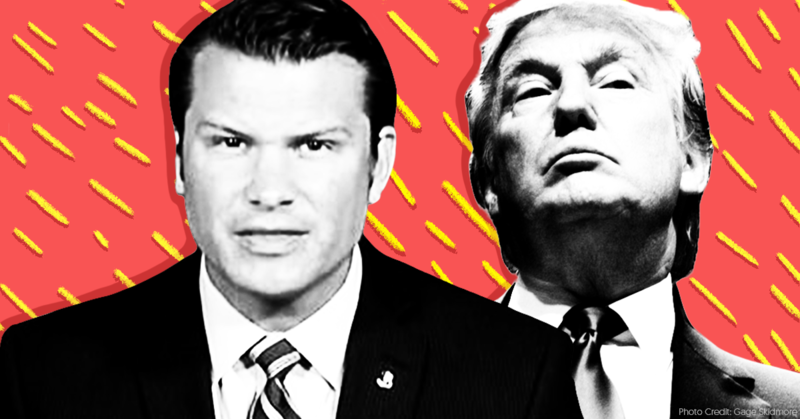 In some ways, Hegseth’s performance last night mimicked what he’s done in his prior sit-downs with the president: He asked broad questions, let Trump free-associate through them, and refused to follow up no matter how wildly the president diverted from the topic at hand. The audience, meanwhile, made no distinction between the interview and any other part of the rally. They cheered the president, jeered his enemies, and chanted “build that wall” when Hegseth mentioned immigration policy. The crowd was excited because the rally had begun. Hegseth -- and Fox -- were just part of the president’s show.